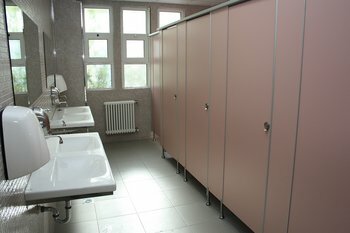 An extensive renovation of all major bathrooms was carried out during the summer. It was an elaborate project because of the limited time available forcompletion and the high standards of construction expertise required. The water supply system has been designed according to the latest European standards, implementing double water supply piping and special connectors, providing the highest hygiene levels against stagnating water, which is critical for a school. Also, pressure regulating valves and water flow economizers have been implemented to reduce the actual water consumption. Multilayer pipes were used, made of cross-linked PE and aluminium layers. The old sewage system was removed and replaced with heavy duty sound-proof pipes. Piping and auxiliary materials used in both water supply and sewage systems are imported from Germany. All electrical equipment and wiring has been fully replaced. New independent electrical panels for each WC have been installed to provide full control and electrical autonomy. New LED lighting of high efficiency has also been installed, connected to motion detectors in order to minimize power consumption. The tile bonding components are of high quality epoxy, to prevent humidity penetration and ensure long lifespan. Bathroom divider panels have been tailor-made using high quality colored material. The floor tiles are made with high quality, full body granite. New heating pipes and high quality radiators without acute edges were installed to prevent accidents. We would like to express our thanks and appreciation to all our parents that contributed to the reconstruction of the school bathrooms. The usage of mobile computer stations could transform any ACS Athens classroom to a computer lab. We purchased two mobile computer stations and 60 laptops for the creation of two mobile labs. Currently, they are used to support HS and MS classes. We wish to thank our PTO for their generous donation that made this project possible. The system consists of advanced detection radars and sensors, evenly distributed at building entrances and in areas that require extra protection, e.g. labs, boiler rooms, etc..
We installed a diesel electric power generator to act as emergency power supply in case of a power black-out. 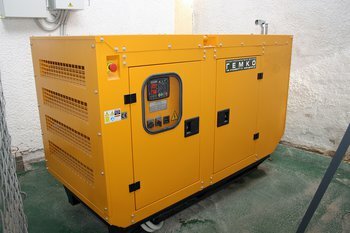 The generator will support the major communication and safety systems of the school, e.g. the public address system, the security cameras, the phone switchboard, the main server and network hubs, etc. 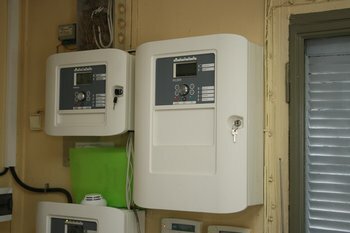 Independent electric switchboards have been installed at each area of interest, which automatically switch to generator power in case of main power failure. A drop down bar has been installed at the main parking entrance, to control access of cars entering or exiting. This bar is remotely operated by the main gate’s security guard. A new metal fence has been installed in the new 5th grade Elementary School wing to increase safety and security of ES children. Twenty five reinforced bollards have been mounted around the main entrance of ACS Athens, to protect people inside the main gate from the outside street traffic. Moreover, an additional component of this grant is the replacement of all school campus outside night lighting with high energy, efficient LED lights. This project will be completed by the end of December. A high tech fire detection system has been installed to protect the athletic and theater buildings. It consists of over 100 addressable smoke and heat detectors, plus sirens and push buttons, evenly spread throughout the areas. This system is connected to the rest of the school’s fire detection system. 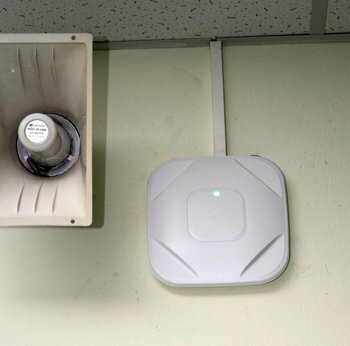 It would accurately detect smoke or fire and provide school security with the exact location of the alarm. Furthermore, the school installed twenty additional sirens throughout the campus, beyond the legal requirements and fire department regulations, to ensure that any person on campus will be safely warned in case of an incident. The cafeteria kitchen and seating areas have been renovated, targeting higher quality standards for students and personnel. 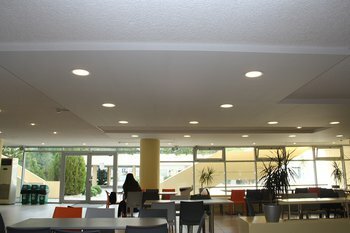 The ceiling of the sitting area has been re-designed to improve acoustics and aesthetics, installing new high performance LED lights together with especially manufactured sound-absorbing panels. 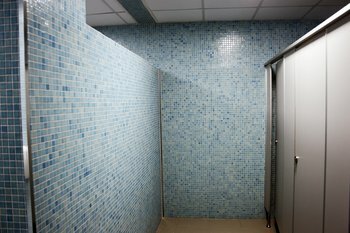 We partially renovated all swimming pool and basketball locker rooms and hallways. 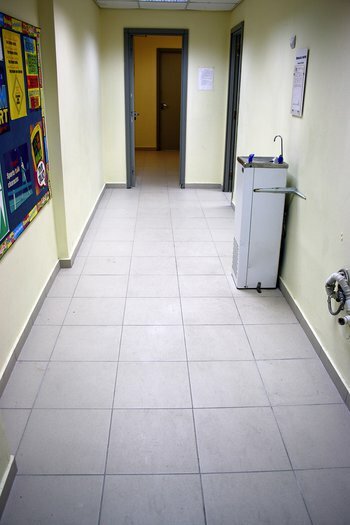 We replaced the existing floor with new anti-slip granite tiles to improve both appearance and hygiene. We certified the gym climbing wall by an independent body (TUV). Furthermore, following the recommendation of TUV, we improved the safety of the wall beyond the standard design. As part of an ongoing maintenance and renovation plan, we fully replaced 6 main electric panels. This ongoing infrastructure improvement is very critical for the safe and uninterrupted operation of ACS Athens. The main waste collection area in the campus has been reviewed and reformed, targeting higher standards in hygiene. New garbage and recycling bins have also been added. More than 50 computer stations (in classrooms and various working positions) have been upgraded by replacing old PCs with modern laptop and desktop computers. We installed new firewall software that makes internet use secure and safe for students and staff. We improved the ACS Athens wireless network (Wi-Fi) by adding new antennas across the campus and upgraded the active network equipment at the Foreign Languages lab. We also purchased new iPads, as well as new projectors for use in the classrooms. We purchased classroom and office furniture for the creation of the New Learning, Writing, Math and IB center at the 2nd floor of HS Library, as well as for the OLP Annex classrooms. Moreover, our maintenance department fulfilled many work orders, satisfying both faculty requests and completing the summer school maintenance schedule.